Starring: SARAH LARK (Oliver!, BBC's I'd Do Anything) as Miss Mona. 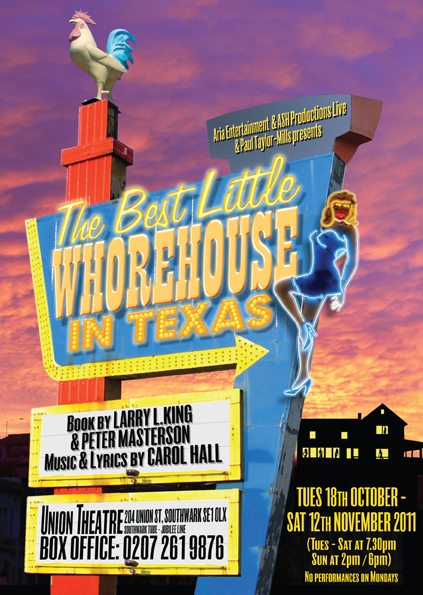 Featuring: JAMES PARKES (The Hired Man) as Sheriff Ed Earl Dodd, LEON CRAIG (Jerry Springer the Opera) as Melvin P.Thorpe, NANCY SULLIVAN (Never Forget, Les Miz) as Shy, FRANKIE JENNA (Dirty Dancing) as Angel, STEPHANIE TAVERNIER (Jerry Springer the Opera) as Jewel, STEPHEN OLIVER WEBB (Lend Me A Tenor) as CJ Scruggs, LINDSAY SCIGLIANO (Once Upon A Time at the Adelphi) as Doatsey Mae, TONY LONGHURST (The Producers) as Senator Wingwoah, ANTHONY WILLIAMSON (Joseph, Evita) as The Governor, LUKE BARRON as Mayor Rufus Poindexter, SCOTT WHEELER as Edsel. Also Featuring: Aimee Buchanan, Jamie Papanicolaou, Kimberly Powell, Jarred Page, Sasi Strallen, Oliver Metcalfe, Kelle Walters, Dayle Hodge, Jodie Lee Wilde, Patrick George, Katy Stredder, Dan O'Brien.